Wayne State University Press, 9780814323588, 436pp. 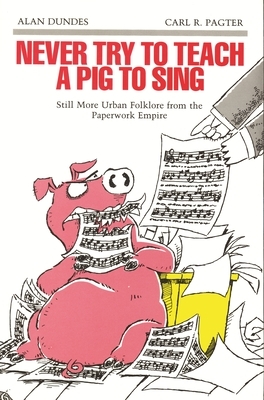 Never Try to Teach a Pig to Sing documents the thriving folklore tradition that circulates in the workplace. Alan Dundes and Carl Pagter have collected more than two hundred and fifty "signs of the times"--the office memoranda, parodies, cartoons, and poems that daily make their way through copy machines, interoffice mail systems, and fax machines and are affixed to bulletin boards and water coolers. The rich vein of urban folklore tapped by this imaginative volume constitutes a great testament to one of the world's most prolific authors--anonymous. The popularity of the items featured in this timely book is apparent by their reproduction in mass or popular cultural form--as greeting cards, plaques, and bumper stickers--reminding us of the inevitable interplay between folklore and mass culture. Dundes and Pagter clearly demonstrate the existence of folklore in the modern urban technological world and refute the notion that folklore reflects only the past. Alan Dundes is a professor of anthropology and folklore at the University of California, Berkeley. He received his Ph.D. from Indiana University.Carl R. Pagter is presently counsel and consultant for a large corporation in California.